Posted on May 23, 2015 at 11:17 am. It’s happening! Like a phoenix arising from the ashes, the new Temple is now taking shape. It is exciting to present this first public unveiling of the conceptual design. 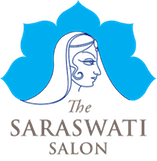 The new Temple is refreshingly innovative yet holds true to Swami Radha’s original vision. It is a sacred space built to let Light in and to send Light out to the world through healing vibrations and prayers – in whatever is our individual way. The Temple is a refuge where we can lift beyond doctrinal differences to rest in the oneness of Divine Light. At the Ashram we have felt your support in so many ways over the past year. We recognize that the Temple belongs to all of us, and we look forward to working together to make the image a reality. Thank you! Only one year after the fire that destroyed the original Temple, we are very happy to present the design for the new Temple of Light! Designed by Patkau Architects, the concept incorporates essential symbolic and historical elements, such as the eight sides, the many doors and windows and the dome shape. The new design moves beyond a geometrical form. The building is an organic collection of windows and panels that come together to create a luminous inner space. The Patkaus’ intent was always to use light as “a primary building material.” They accomplished this by creating portals of light that extend from the foundation to the oculus. Light then enters the building from every angle, washing the interior surfaces. The new Temple promises to be a beautiful, luminous, sacred space. A lotus opening to the Light. Browse images of the design on our new website dedicated to the Temple build project. The website offers news, updates, information on the design and well as ways you can help us build the new Temple of Light. Our aim is to complete the new Temple by the end of 2016. This is a unique and ambitious project that will span two years of planning and building. We are currently estimating a total cost of 2 million dollars. Watch this video update to get an idea of how the new Temple concept will look at the current building site. The Temple of Light is the legacy of one woman, Swami Sivananda Radha. It began as a dream and transformed into a lifelong aspiration that she saw realized when the original Temple of Light was completed in 1992. Her inspirational vision – for a Temple open to people from all spiritual traditions, a centre of Light, hope and unity – continues to guide us today. 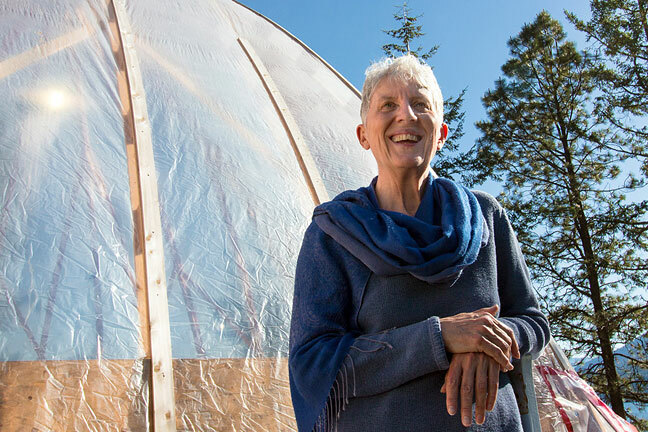 We are honouring her vision by ensuring a Temple of Light stands for future generations and Yasodhara Ashram continues to be a spiritual home to all who come. After the Temple fire one year ago, I felt at first a deep grief, a numbness that said, “Is this true – has it really happened?” And yet with every tragedy there is an experience of opening, a realization that there is something more behind the scenes that I just get a glimpse of… perhaps “awe” is the best word to describe it. The fire showed us our strength as a spiritual community. We reached out to each other, and others reached out to us in a continuous expression of loving. It was all at once and ongoing – loss, letting go and opening to the next phase. It was a profound teaching. 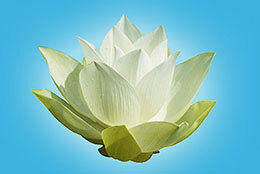 Swami Radha says that part of the practice of yoga is letting go of the ideas in the mind. For me, part of the grieving has been letting go of the image I held in my mind of how the Temple used to be. As I began to let go of my old ideas, the lightness and the beauty of the new design delighted me. The architects, Patricia and John Patkau, used the word “luminosity” right from the start and it is that element that shines through – a reminder of the Light and our lineage. Marlene Roza of Calgary donates monthly to the Ashram’s Circle of Sustainability and made an additional donation to the Temple Rebuild last year. She reflects on her approach to giving back. In 2007, I was part of a group that realized the Ashram needed steady donors. 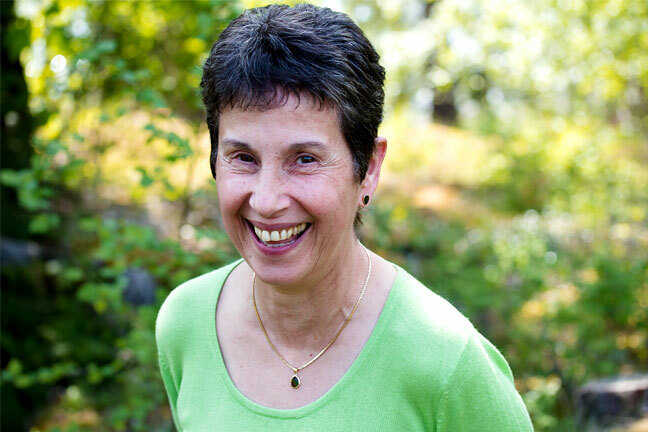 At the same time, I wondered about my own financial situation – “Would I have enough to retire?”Reading about money from both spiritual and secular sources, I learned that experts – including Swami Radha – agree that money is an expression of energy. And it needs to move. In the Temple one day, I made a promise to tithe – to give a percentage of my gross income to the Ashram. I went from donating $25 a month to giving 20 percent of my gross annual income. Because of the contribution, I considered that 20 percent of my employment was actually Karma Yoga. Now that I’m retired, this commitment continues to make me feel light and happy. Donations are needed more than ever now for the Temple Rebuild. I encourage people to review what they are giving. Join the Circle, increase monthly donations, or make a one-time gift. It’s such an opportunity to practise gratitude. 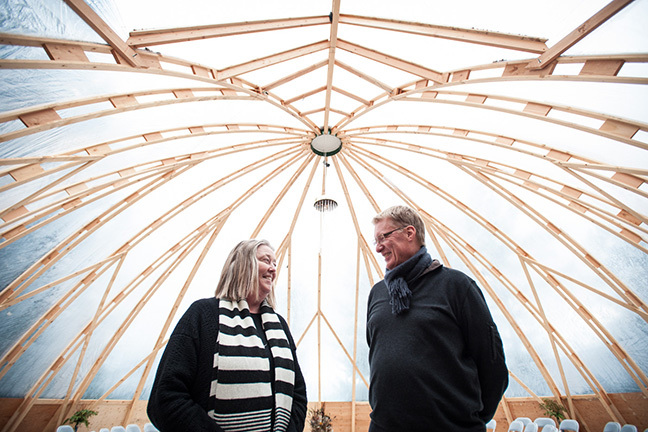 Vancouver-based Governor General award-winning architects, John and Patricia Patkau welcomed the opportunity to work with our community to explore the creation of sacred space. The design for the new Temple of Light honours its original form and the rich history of the site, all the while capturing an unknowable, luminous essence. For over two decades, the Ashram has been committed to reducing our environmental footprint and investing in long-term sustainable and resilient systems. We were certified as a Carbon Neutral community in 2012, and have garnered many awards for our environmental efforts. Our approach to the Temple building project keeps this commitment at the forefront. We are currently exploring energy saving approaches such as ‘Passive House’ construction. Our many creative contributing partners in this endeavour have been chosen for their expertise in resilient design. Together, we are developing solutions towards a highly efficient, environmentally sensitive building. Body as a Temple: Hidden Language Hatha Yoga, Sacred Dance and Relaxation: Give yourself the time to honour and respect your body. In this program, you will listen to your body’s messages through Hidden Language Hatha Yoga – a method Swami Radha pioneered to find the mystical meanings of the asanas; you will practice devotional movement through sacred dance as an expression of the heart; and you will absorb the healing and rejuvenating benefits of deep relaxation. 10 Days of Yoga: A Journey of Self-Discovery and Renewal: Give yourself ten days to expand your understanding of who you are and who you want to be – ten days of reprieve from stress in a safe and nurturing place of reflection. The peace and beauty of the natural surroundings and the guidance of experienced teachers can help you open your mind to new possibilities and support you in finding your own answers. You will leave with tools to create more meaning, joy and relaxation in your life and with more trust in your ability to live a balanced life. 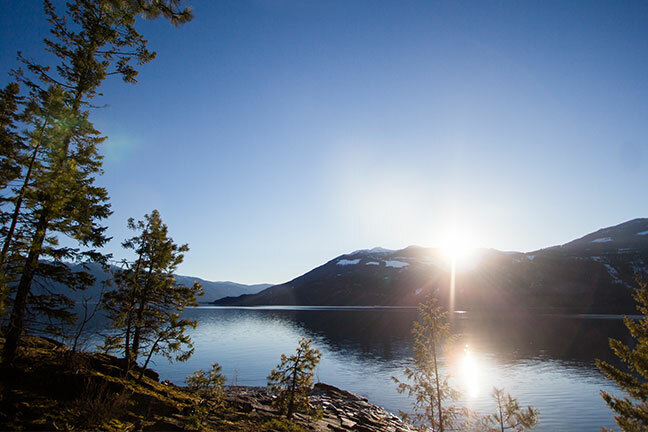 Other ways of being here: Yasodhara Ashram offers a unique setting for your next group retreat or gathering. We can accommodate a wide range of groups and occasions. Artist and Professional Renewal Retreats and Personal Retreats are available year-round. Take time to renew spiritually and creatively. You still have time to join our Outreach offerings in Victoria and Kelowna in May. Or plan ahead for our fall Eastern Canada tour to Toronto, Ottawa, Montreal and Halifax. One year later. To Remember, Honour and Celebrate – On the one-year anniversary of the fire at the Temple of Light, we will gather with our local community to remember our beloved Temple, honour the firefighters and ambulance society for their efforts, and celebrate new beginnings. 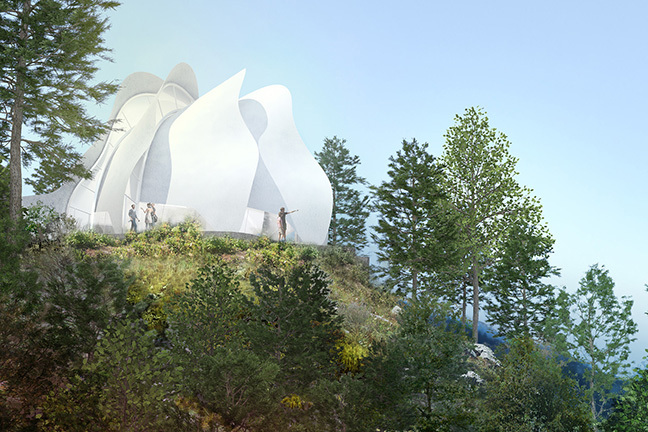 We will present the design concept for the new Temple of Light, and show the art pieces donated by local artists and craftspeople for an online auction to raise funds for the new Temple. Join us if you can – Saturday, June 6, 2015 – 2:30 pm. All are welcome! – Men and women of all ages and from all walks of life are welcome at the Ashram. Our oldest resident is now 87 and our youngest 19. On Facebook, we introduce you to the current men’s group. They offer their work and gain new skills, learn to live in community and receive all the benefits the Ashram offers. Come join us anytime. 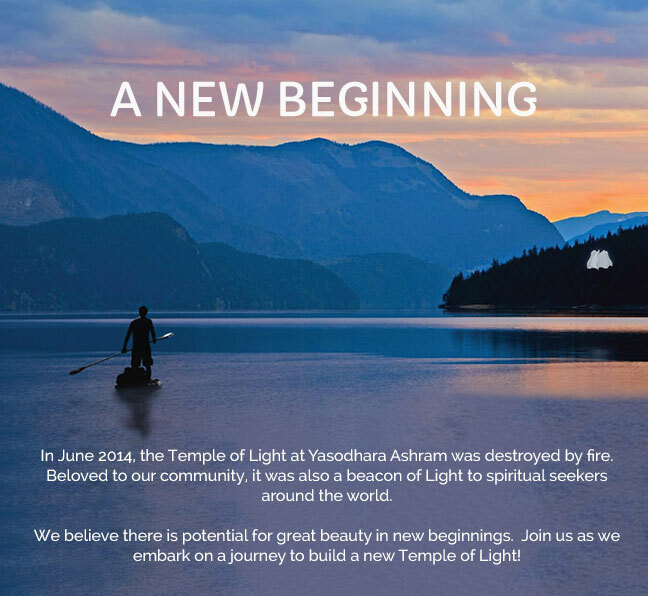 Summer Invitation – Help us build the new Temple of Light! By attending courses and retreats, you help us generate the funds we need to build the Temple. Invite friends and family to join you. Or plan a group retreat. You receive the benefits of the Ashram and at the same time are giving to a wonderful cause – helping create a place of unity and hope in a world of disparity and conflict. We look forward to seeing you soon! Stay with a Difference – The upper level of Cabin 3 in Yasodhara Heights is available for summer rental starting June 7. This beautiful space, with glorious view, includes one bedroom and bath, kitchen, living area and deck. The Ashram is only a 15-30 minute walk or a short drive away! 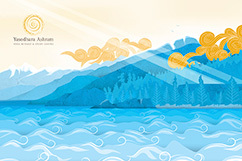 Explore this different way to be part of the Ashram here. Swami Radha often spoke of the Cathedral of Consciousness or inner temple within each of us. Use the reflections below to explore how to enter that sacred space and keep the connection alive. The first Temple of Light at the Ashram came into being through Swami Radha’s commitment to her long-term vision. What is your inner vision and how do you keep it alive? Sit quietly, focusing on your breath. With each inhalation, draw Light into your being; with each exhalation, relax and be receptive. Imagine that you are in a beautiful place; look around and see the beauty around you. See yourself walking along a path. As you turn a corner you see a beautiful, white building. It is a kind of church or temple. It has many windows and doors – it is open to the Light. Walk towards it and walk around it – what do you see inside?Know that you can come back to this sacred place any time you like. Draw and color your inner temple, using crayons. Put your drawing on a wall at eye level. Stand in front of it in the Mountain pose (Tadasana). Find your foundation in the pose. Ask yourself, what is my foundation for my inner temple? Write. Now do the Divine Light Invocation. Put your temple drawing in the Light. What do you have to do to build your inner temple? What are the building blocks? Write. 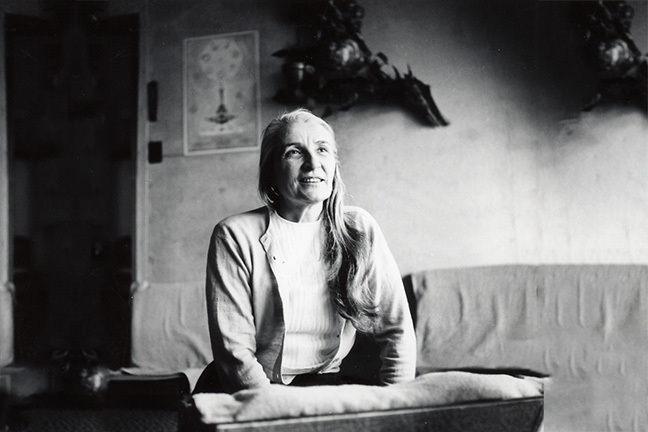 “Divine Mother needs a sacred space to be within us. Like our Temple of Light at the Ashram. the inner temple cannot be built unless there is harmony.” (p. 200) Reflect on the following questions: How do I learn to open my mind and heart to new ways of being? How am I cultivating harmony within so there is space in my heart for a new idea, a new concept, a new person, a new form of Divine Mother? In the Divine Light Invocation book, Swami Radha says: “Before you go to sleep each night, see your body and bed surrounded by a spiral (like a cocoon) of Divine Light. In this way your physical body, which is the temple of your soul, will be protected so that the soul can do its work in safety.” (p. 54) Do this practice and write some notes upon awakening. What are your observations?